Want to make a great album to store lots of your photographs? Well, this little beauty will store just under 60 photographs to show your nearest and dearest all your memories. Get those photos off your computer, print them off and get started – you will love the finished article! This is a project I completed at one of my day workshops and as it went down so well and with so many of you mentioning on Facebook you can’t attend due to being elsewhere in the world, I thought I’d share it with you too! The great thing is you don’t have to buy anything special to make it – these entire projects are made with supplies I already had in my crafty stash!! This Foto Folio follows the same format as the other 4 so the overall size of the finished album is exactly the same therefore they will all sit beautifully side by side on a shelf together. With Step by Step Video Tutorials and PDF Instructions too, as with the other 3, you will find completing this project very easy to do. Again, this Folio uses very few supplies so you will probably already have most of what you need to make it in your Crafting Stash. I think your workshops are wonderful Dawn, and a lot of thought goes into them to make them as easy as possible. 10/10. I just finished this foto folio. Your directions were spot on and so easy to follow. 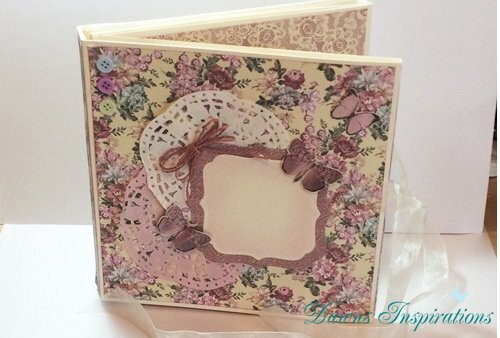 I’ve made the 3 foto folios and will make more to give as gifts. I’m looking forward to your next creations. I just love your work!!! 18 x Sheets of A4 (UK) you can also use US A4 or 12×12-these can be cut down as I give you all the measurements. Envelope Punch Board if you have one. Ink to match the paper collection you have chosen. Great easy to follow workshops Dawn, I’ve watched all the way through and can’t wait to get started. Due to the nature of this product, tutorials cannot be refunded. The pictures and instructions in this tutorial may NOT be sold or reproduced for distribution in any manner - digitally or otherwise.